[S1] Ruth Bennett, Naudain Family of Delaware (Geneva, Neb. : n.pub., 1941), p. 88 (naming Joshua C. Wilson as her father). This material is a typescript of "notes" in Ms. Bennett's possession and apparently was originally written and compiled by James W. Lattomus. Copies are with the D.A.R. Library, Washington, D.C., and Roger Bartlett, Austin, Tex., and can be viewed at http://www.rabgenealogy.com/ui53.htm. The notes contain some inconsistencies, and page 45 was missing from the D.A.R. Library copy when it was copied. [S1] Ruth Bennett, Naudain Family of Delaware (Geneva, Neb. : n.pub., 1941), p. 88 (naming Joshua C. Wilson as his father). This material is a typescript of "notes" in Ms. Bennett's possession and apparently was originally written and compiled by James W. Lattomus. Copies are with the D.A.R. Library, Washington, D.C., and Roger Bartlett, Austin, Tex., and can be viewed at http://www.rabgenealogy.com/ui53.htm. The notes contain some inconsistencies, and page 45 was missing from the D.A.R. Library copy when it was copied. [S1] Ruth Bennett, Naudain Family of Delaware (Geneva, Neb. : n.pub., 1941), p. 88. This material is a typescript of "notes" in Ms. Bennett's possession and apparently was originally written and compiled by James W. Lattomus. Copies are with the D.A.R. Library, Washington, D.C., and Roger Bartlett, Austin, Tex., and can be viewed at http://www.rabgenealogy.com/ui53.htm. The notes contain some inconsistencies, and page 45 was missing from the D.A.R. Library copy when it was copied. [S1] Ruth Bennett, Naudain Family of Delaware (Geneva, Neb. : n.pub., 1941), p. 88 (naming James M. Teeple as his father). This material is a typescript of "notes" in Ms. Bennett's possession and apparently was originally written and compiled by James W. Lattomus. Copies are with the D.A.R. Library, Washington, D.C., and Roger Bartlett, Austin, Tex., and can be viewed at http://www.rabgenealogy.com/ui53.htm. The notes contain some inconsistencies, and page 45 was missing from the D.A.R. Library copy when it was copied. [S1] Ruth Bennett, Naudain Family of Delaware (Geneva, Neb. : n.pub., 1941), p. 88 (naming James M. Teeple as her father). This material is a typescript of "notes" in Ms. Bennett's possession and apparently was originally written and compiled by James W. Lattomus. Copies are with the D.A.R. Library, Washington, D.C., and Roger Bartlett, Austin, Tex., and can be viewed at http://www.rabgenealogy.com/ui53.htm. The notes contain some inconsistencies, and page 45 was missing from the D.A.R. Library copy when it was copied. [S1] Ruth Bennett, Naudain Family of Delaware, above, pp. 88-89. Other Names*: Josephine Bridges Todd, Josephine Todd, Josie Bridges Todd, Josie Todd. Note*: • They had no children. • One source says she was born on 25 Dec 1869, another says 25 Dec 1870. • Her Find A Grave memorial, which includes pictures of her cemetery plot, is here. [S1] Ruth Bennett, Naudain Family of Delaware (Geneva, Neb. : n.pub., 1941), p. 89 (naming Martin V. Bridges as her father). This material is a typescript of "notes" in Ms. Bennett's possession and apparently was originally written and compiled by James W. Lattomus. Copies are with the D.A.R. Library, Washington, D.C., and Roger Bartlett, Austin, Tex., and can be viewed at http://www.rabgenealogy.com/ui53.htm. The notes contain some inconsistencies, and page 45 was missing from the D.A.R. Library copy when it was copied. [S961] Find A Grave, online at http://www.findagrave.com, memorial for Josie Bridges Todd, memorial no. 87813255, viewed on 28 Dec 2014. [S1] Ruth Bennett, Naudain Family of Delaware, above, p. 89 (first bullet). [S961] Find A Grave, online, above, memorial for Josie Bridges Todd, memorial no. 87813255, viewed on 28 Dec 2014 (giving 25 Dec 1869 as her birth date) (second bullet). [S1] Ruth Bennett, Naudain Family of Delaware, above, p. 89 (giving 25 Dec 1870 as her birth date) (second bullet). [S1] Ruth Bennett, Naudain Family of Delaware, above, p. 89 (giving 15 Nov 1908 as her death date) (third bullet). [S961] Find A Grave, online, above, memorial for Josie Bridges Todd, memorial no. 87813255, viewed on 28 Dec 2014 (giving 18 Nov 1909 as her death date) (third bullet). • Her Find A Grave memorial, which includes a photograph of her grave marker, is here. [S1] Ruth Bennett, Naudain Family of Delaware (Geneva, Neb. : n.pub., 1941), p. 89 (naming George H. Logan as her father). This material is a typescript of "notes" in Ms. Bennett's possession and apparently was originally written and compiled by James W. Lattomus. Copies are with the D.A.R. Library, Washington, D.C., and Roger Bartlett, Austin, Tex., and can be viewed at http://www.rabgenealogy.com/ui53.htm. The notes contain some inconsistencies, and page 45 was missing from the D.A.R. Library copy when it was copied. [S961] Find A Grave, online at http://www.findagrave.com, memorial for Isabelle Logan Fitch, memorial no. 60430082, viewed on 28 Dec 2014. [S961] Find A Grave, online at http://www.findagrave.com, memorial for William A. Fitch, memorial no. 60430813, viewed on 28 Dec 2014. [S1] Ruth Bennett, Naudain Family of Delaware (Geneva, Neb. : n.pub., 1941), p. 89 (naming Merritt Noxon Willitts as his father). This material is a typescript of "notes" in Ms. Bennett's possession and apparently was originally written and compiled by James W. Lattomus. Copies are with the D.A.R. Library, Washington, D.C., and Roger Bartlett, Austin, Tex., and can be viewed at http://www.rabgenealogy.com/ui53.htm. The notes contain some inconsistencies, and page 45 was missing from the D.A.R. Library copy when it was copied. [S1] Ruth Bennett, Naudain Family of Delaware (Geneva, Neb. : n.pub., 1941), p. 89 (naming Merritt Noxon Willitts as her father). This material is a typescript of "notes" in Ms. Bennett's possession and apparently was originally written and compiled by James W. Lattomus. Copies are with the D.A.R. Library, Washington, D.C., and Roger Bartlett, Austin, Tex., and can be viewed at http://www.rabgenealogy.com/ui53.htm. The notes contain some inconsistencies, and page 45 was missing from the D.A.R. Library copy when it was copied. [S1] Ruth Bennett, Naudain Family of Delaware (Geneva, Neb. : n.pub., 1941), p. 89 (naming Merritt Noxon Willitts [sic] as his father). This material is a typescript of "notes" in Ms. Bennett's possession and apparently was originally written and compiled by James W. Lattomus. Copies are with the D.A.R. Library, Washington, D.C., and Roger Bartlett, Austin, Tex., and can be viewed at http://www.rabgenealogy.com/ui53.htm. The notes contain some inconsistencies, and page 45 was missing from the D.A.R. Library copy when it was copied. [S961] Find A Grave, online at http://www.findagrave.com, memorial for Merritt Noxon Willits, Jr., memorial no. 15025352, viewed on 13 Mar 2018. [S1340] The Morning News, Wilmington, Del., online at http://www.newspapers.com, 6 Feb 1930, p. 2, col. 1 (obituary of Merritt Noxon Willits). [S961] Find A Grave, online, above, memorial for Merritt Noxon Willits, Jr., memorial no. 15025352, viewed on 13 Mar 2018 (giving the date but not the place). [S961] Find A Grave, online, above, memorial for Merritt Noxon Willits, Jr., memorial no. 15025352, viewed on 13 Mar 2018 (not giving the date). [S1] Ruth Bennett, Naudain Family of Delaware, above, pp. 89-90. Marriage*: He married Elizabeth Noxon Merritt, daughter of Thomas Schee Merritt and Mary Noxon. [S1] Ruth Bennett, Naudain Family of Delaware (Geneva, Neb. : n.pub., 1941), p. 89 (naming Thomas Willitts as his father). This material is a typescript of "notes" in Ms. Bennett's possession and apparently was originally written and compiled by James W. Lattomus. Copies are with the D.A.R. Library, Washington, D.C., and Roger Bartlett, Austin, Tex., and can be viewed at http://www.rabgenealogy.com/ui53.htm. The notes contain some inconsistencies, and page 45 was missing from the D.A.R. Library copy when it was copied. [S1] Ruth Bennett, Naudain Family of Delaware, above, p. 89 (naming Horatio Nelson Willitts as his father). Note*: He was from Tuckertown, New Jersey. Marriage*: She married Horatio Nelson Willitts, son of Thomas Willitts and _____ _____. [S1] Ruth Bennett, Naudain Family of Delaware (Geneva, Neb. : n.pub., 1941), p. 89 (naming Thomas Schee Merritt as her father). This material is a typescript of "notes" in Ms. Bennett's possession and apparently was originally written and compiled by James W. Lattomus. Copies are with the D.A.R. Library, Washington, D.C., and Roger Bartlett, Austin, Tex., and can be viewed at http://www.rabgenealogy.com/ui53.htm. The notes contain some inconsistencies, and page 45 was missing from the D.A.R. Library copy when it was copied. [S1] Ruth Bennett, Naudain Family of Delaware, above, p. 89 (naming Mary Noxon as her mother). Marriage*: She married Thomas Schee Merritt, son of Thomas Merritt and Hannah Schee. [S1] Ruth Bennett, Naudain Family of Delaware (Geneva, Neb. : n.pub., 1941), p. 89 (naming Benjamin Noxon as her father). This material is a typescript of "notes" in Ms. Bennett's possession and apparently was originally written and compiled by James W. Lattomus. Copies are with the D.A.R. Library, Washington, D.C., and Roger Bartlett, Austin, Tex., and can be viewed at http://www.rabgenealogy.com/ui53.htm. The notes contain some inconsistencies, and page 45 was missing from the D.A.R. Library copy when it was copied. [S1] Ruth Bennett, Naudain Family of Delaware (Geneva, Neb. : n.pub., 1941), p. 89 (naming Benjamin Noxon as his father). This material is a typescript of "notes" in Ms. Bennett's possession and apparently was originally written and compiled by James W. Lattomus. Copies are with the D.A.R. Library, Washington, D.C., and Roger Bartlett, Austin, Tex., and can be viewed at http://www.rabgenealogy.com/ui53.htm. The notes contain some inconsistencies, and page 45 was missing from the D.A.R. Library copy when it was copied. [S1] Ruth Bennett, Naudain Family of Delaware, above, p. 89 (naming Benjamin Noxon as her father). [S1] Ruth Bennett, Naudain Family of Delaware (Geneva, Neb. : n.pub., 1941), p. 89 (naming Thomas Noxon as his father). This material is a typescript of "notes" in Ms. Bennett's possession and apparently was originally written and compiled by James W. Lattomus. Copies are with the D.A.R. Library, Washington, D.C., and Roger Bartlett, Austin, Tex., and can be viewed at http://www.rabgenealogy.com/ui53.htm. The notes contain some inconsistencies, and page 45 was missing from the D.A.R. Library copy when it was copied. [S1] Ruth Bennett, Naudain Family of Delaware, above, p. 89 (naming Benjamin Noxon as his father). [S1] Ruth Bennett, Naudain Family of Delaware, above, p. 89 (naming Thomas Noxon as his father). Other Names*: Rachel Wilson, Rachel Rothwell Wilson Watkins, Rachel Wilson Watkins, Rachel Rothwell Watkins, Rachel Watkins. [S1] Ruth Bennett, Naudain Family of Delaware (Geneva, Neb. : n.pub., 1941), p. 90 (naming William Wilson as her father). This material is a typescript of "notes" in Ms. Bennett's possession and apparently was originally written and compiled by James W. Lattomus. Copies are with the D.A.R. Library, Washington, D.C., and Roger Bartlett, Austin, Tex., and can be viewed at http://www.rabgenealogy.com/ui53.htm. The notes contain some inconsistencies, and page 45 was missing from the D.A.R. Library copy when it was copied. [S1343] Journal-Every Evening, Wilmington, Del., above, 1 Nov 1943, p. 10, col. 4 (obituary for Mrs. Rachel Watkins) (naming Mrs. Lydia Naudain Wilson as her mother). [S1343] Journal-Every Evening, Wilmington, Del., above, 1 Nov 1943, p. 10, col. 4 (obituary for Mrs. Rachel Watkins) (stating that she died after a lingering illness). [S1343] Journal-Every Evening, Wilmington, Del., above, 1 Nov 1943, p. 10, col. 4 (obituary for Mrs. Rachel Watkins). 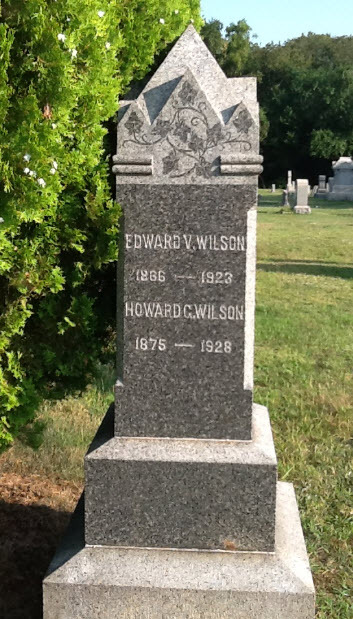 Edward V. Wilson's tombstone, Forest Presbyterian Church Cemetery, Middletown, Del., courtesy of James Ethridge. Other Names*: Edward Wilson, Farmer Wilson. • An obituary, which is not reprinted on this site because of possible copyright restrictions, appeared in The Evening Journal, Wilmington, Delaware, on 23 Jul 1923 and is available online through www.newspapers.com here for a fee. [S1] Ruth Bennett, Naudain Family of Delaware (Geneva, Neb. : n.pub., 1941), p. 90 (naming William Wilson as his father). This material is a typescript of "notes" in Ms. Bennett's possession and apparently was originally written and compiled by James W. Lattomus. Copies are with the D.A.R. Library, Washington, D.C., and Roger Bartlett, Austin, Tex., and can be viewed at http://www.rabgenealogy.com/ui53.htm. The notes contain some inconsistencies, and page 45 was missing from the D.A.R. Library copy when it was copied. [S1337] The Evening Journal, Wilmington, Del., above, 23 Jul 1923, p. 1, col. 1 (obituary of Edward V. Wilson) (naming L. Annie Naudain as his mother). [S1337] The Evening Journal, Wilmington, Del., above, 23 Jul 1923, p. 1, col. 1 (obituary of Edward V. Wilson). [S961] Find A Grave, online at http://www.findagrave.com, memorial for Edward V. Wilson, memorial no. 117253424, viewed on 20 Aug 2016 (not giving the date). Howard Groome Wilson's tombstone, Forest Presbyterian Church Cemetery, Middletown, Del., courtesy of James Ethridge. [S1340] The Morning News, Wilmington, Del., above, 6 Mar 1928, p. 2, col. 3 (obituary for Howard G. Wilson) (naming Mrs. Annie Naudain Wilson as his mother). [S961] Find A Grave, online at http://www.findagrave.com, memorial for Howard G. Wilson, memorial no. 117253492, viewed on 12 Mar 2018 (giving the year but no other information). [S1340] The Morning News, Wilmington, Del., above, 6 Mar 1928, p. 2, col. 3 (obituary for Howard G. Wilson) (stating that he was born and reared at the Levels; not giving the date). [S1340] The Morning News, Wilmington, Del., above, 6 Mar 1928, p. 2, col. 3 (obituary for Howard G. Wilson) (stating that he died Sunday night "following an illness from complications"). [S1340] The Morning News, Wilmington, Del., above, 6 Mar 1928, p. 2, col. 3 (obituary for Howard G. Wilson). [S961] Find A Grave, online, above, memorial for Howard G. Wilson, memorial no. 117253492, viewed on 12 Mar 2018 (not giving the date). Other Names*: Goldie Goodwin Wilson, Goldie Wilson. [S427] Portrait and Biographical Record of the Eastern Shore of Maryland (New York, N.Y..: Chapman Pub. Co., 1898), p. 131 (giving his name as Harry H. Hyland and naming William A. Hyland as his father). [S1] Ruth Bennett, Naudain Family of Delaware (Geneva, Neb. : n.pub., 1941), p. 90 (naming William A. Hyland as his father). This material is a typescript of "notes" in Ms. Bennett's possession and apparently was originally written and compiled by James W. Lattomus. Copies are with the D.A.R. Library, Washington, D.C., and Roger Bartlett, Austin, Tex., and can be viewed at http://www.rabgenealogy.com/ui53.htm. The notes contain some inconsistencies, and page 45 was missing from the D.A.R. Library copy when it was copied. [S1] Ruth Bennett, Naudain Family of Delaware, above, p. 90 (stating that he lived in Wilmington, Delaware). [S427] Portrait and Biographical Record of the Eastern Shore of Maryland, above, p. 131 (stating that he was a merchant in New Jersey). [S1] Ruth Bennett, Naudain Family of Delaware, above, p. 91 (stating that he lived in Federalsburg, Maryland). [S427] Portrait and Biographical Record of the Eastern Shore of Maryland, above, p. 131 (stating that he was a bookkeeper of the Mutual Reserve Fund Association of New York).